A member of the U.S. Professional Golfers Association for over 15 years, Mike served as assistant professional at Bel Air CC, teaching professional at Riviera CC, and head golf professional at Palos Verdes CC. McTeigue was voted the 1995 Teacher of the Year for the Northern California Section of the Professional Golfers Association. He was a popular speaker on golf instruction at sectional meetings of the Professional Golfer’s Association. He was an Approved Speaker in the Etonic PGA Section Education Program and a faculty member in the PGA’s Golf Professional Training Program. He was an instructor in the PGA’s Professional Training and Development Seminar Program. He was an Invited Speaker at the Second World Scientific Congress of Golf at St. Andrews, Scotland in July 1994, at the Meet the Mentors Golf Summit preceeding the 1995 Ryder Cup Matches in Rochester, NY., and the NCPGA Player and Teacher Development Forum in 1998. Mike McTeigue has been a pioneer in applying high-technology to the analysis and training of complex sports motions, especially the golf swing. His SportSense products embodied McTeigue’s innovative approach to motor-learning, called Real-time Motion Training (RMT). This involves precise biomechanical analysis and customized, instantaneous auditory biofeedback as the athlete trains in the actual sports environment using his or her own equipment. McTeigue is the co-inventor of RMT products for professional instructors the Swing Motion Trainer and consumers the Golf Swing Tuner and the X Factor Sensor. He has used the Swing Motion Trainer to analyze the golf swings of more than 160 U.S. PGA, Senior PGA Tour and LPGA professionals. His work produced the “X Factor” articles with Jim McLean; the “Science of the Swing” instruction series in GOLF Magazine, the Golf Digest article, “How’s Your Grip Pressure?”; and the Senior Golfer series on “Curing Your Slice”; as well as numerous articles in golf trade publications. 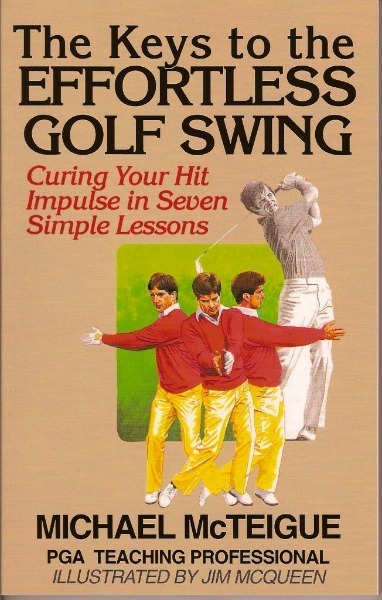 McTeigue also authored the hardcover book and companion video, The Keys to the Effortless Golf Swing, which GOLF Magazine featured as top selections. His newest book is Bulletproof Putting in Five Easy Lessons, available in paperback and ebook editions. He graduated Phi Beta Kappa from UCLA with a degree in Psychology, and he received his Masters in Business Administration from Stanford University’s Graduate School of Business. Wouldn’t you love to lower your average score by five shots this season, with minimal effort? Sharpening your putting skill is the quickest and easiest way to lower your scores and enhance your enjoyment of the great game of golf. The secret to lower scoring is to sink more putts of eight feet or less while consistently lagging long putts close to the hole to avoid three putting. The Bulletproof Putting System teaches you to do exactly that, in five easy lessons. •	Utilize precious practice and warm up time to your best advantage. Bulletproof Putting in Five Easy Lessons is written in an approachable style by Michael McTeigue, former Northern California PGA Teacher of the Year and author of the popular full-swing instruction classic, The Keys to the Effortless Golf Swing. Michael conducted thousands of golf lessons as a PGA professional at Bel Air Country Club, Riveria Country Club, and Palos Verdes Golf Club in California. His beautifully illustrated new book will improve your putting and enrich your enjoyment of the game. Bulletproof Putting in Five Easy Lessons is certain to become a treasured favorite in your golfing library.